Use of Award Funds: Each applicant must agree in writing that, if given the award, he or she will use the award funds for his or her formal education (e.g., tuition, school fees, schoolbooks). Application/Selection Process: Parents or coaches of players, or players who feel they meet the award criteria may apply online by submitting the application at the link below. Applications must be followed with letters of recommendation from the player's team head coach and at least one of the following: 1) High school teacher or school official, or 2) representative from a community organization for which the applicant has volunteered. Applicants must also provide valid school documentation showing current grade point average. Completed applications and supporting documentation will be reviewed by a committee within RYHA that will select the final the winner. Applications and supporting documentation are due to RYHA no later than February 28, 2019. 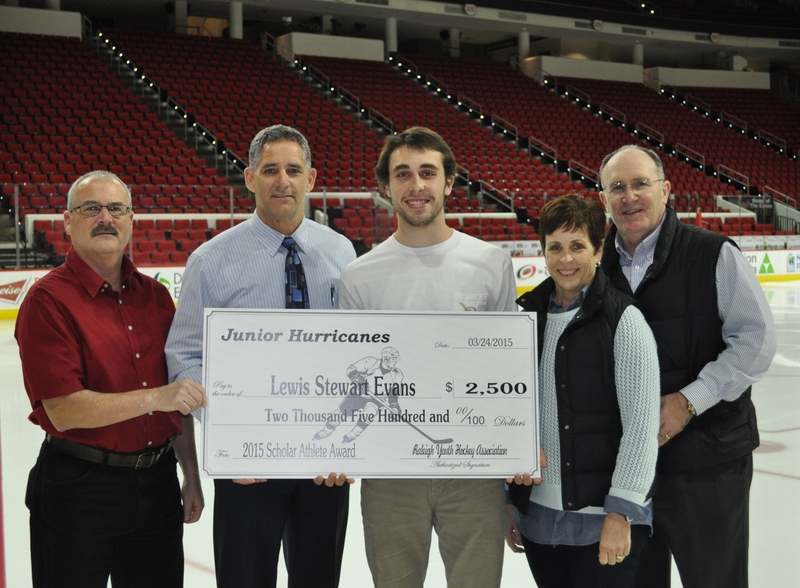 Please mail your supporting documentation to: Junior Hurricanes Scholar-Athlete Award, c/o RYHA, P.O. Box 61400, Raleigh NC 27661. Award recipients will be announced in March 2018. The 2016 winner was Riley Johnson. Riley played for the Junior Hurricanes U16 AAA National team. Riley was a junior at Wakefield High School in Raleigh, NC, and carried a weighted 4.3 GPA, he was also enrolled in several Honors and AP Courses and was an active volunteer with Triangle Special hockey for the past 6 years. Presenting the award was Dan Hollis, President of the Junior Hurricanes and Steve Henley, Executive Director of the Junior Hurricanes.